Adding a local flair to set design can be one of the best creative challenges — and opportunities — for scenic designers. Sets that serve a particular city often look for ways to mix in references to local architecture, culture or natural resources, but the trick is often to work these elements in without being obvious about it. With that in mind, and as part of our Focus On Set Design Trends, we take a look at some examples of localism in set design. 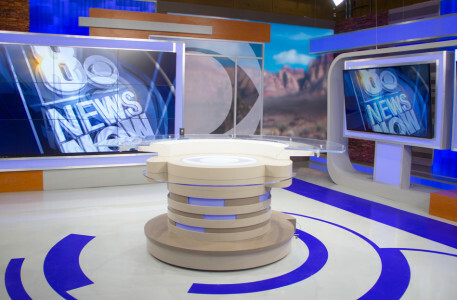 KLAS, the CBS affiliate in Las Vegas, Nevada, incorporates a wide variety of local architectural reference into its vibrant set. The city’s active lifestyle and bright neon lights are hinted at with the banded textures with integrated backlit segments and the curved ribbons that wrap around scenic elements. While hints of various shades of bright blue are integrated throughout, including on the floor decals, risers and backgrounds, the set doesn’t feel over-the-top or garish. The set, designed by Park Place Studio, also takes advantage of Nevada’s squared northwest border to tuck an outline of the into a rectangular glass panel. Finally, the design also works in references to the viewing area’s natural beauty with faux stonework and duras depicting desertscapes. 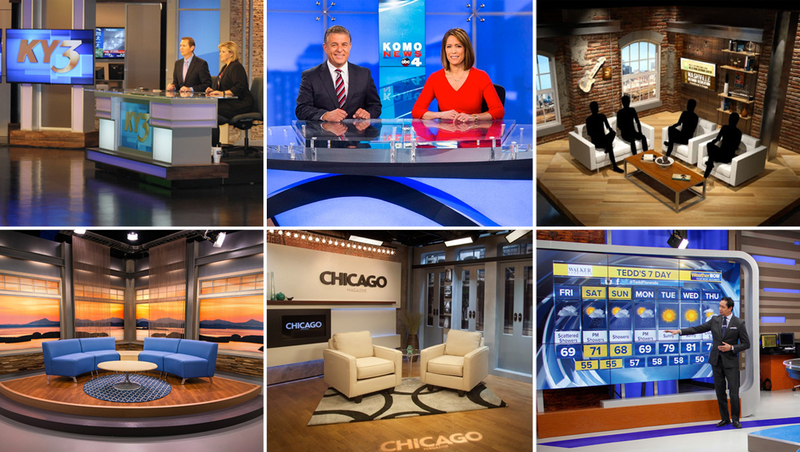 Seattle’s KCPQ combines dimensional reclaimed wood with exposed beams and transom headers to capture the Pacific Northwest. 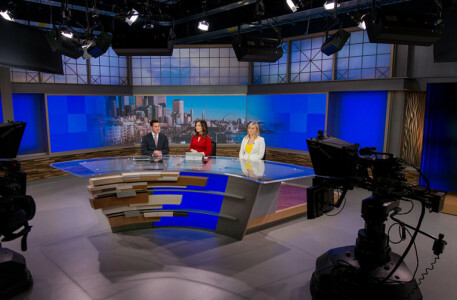 Designed by Broadcast Design International, with technology from Primeview, the set includes multiple monitor walls, a LED wall camera center and a wide view of Puget Sound in the interview area.